Each time Apple introduces a new iPhone model, we get many questions about compatiblity: Will the accessories you already own—cases, speakers, chargers, and the like—work with the new model? In some years, such as when Apple replaced the iPhone 4 with the iPhone 4S, there are few physical and electrical differences, so almost everything works. Other times, Apple changes both the size and the electronics of the phone: The iPhone 5, for example, had both a different shape and a completely different charge/sync connector. This year, we get a little bit of both, as Apple has introduced both the iPhone 5s, which is nearly identical on the outside to last year’s model while being significantly upgraded on the inside, and the iPhone 5c, which uses a completely new exterior design while retaining the guts of the iPhone 5. How well will your current iOS accessories work with these new models? We’ve been testing various gadgets and gear, and here’s what we’ve found. If you’re upgrading from an iPhone 5 to an iPhone 5s, there’s good news: The two phones are identical in size and shape, so most cases for the 5 will fit the 5s, and vice versa. This includes Apple’s new iPhone 5s Case, which fits the iPhone 5 just fine. I say “most” because there’s one possible hangup here: While the back camera lens is roughly the same size, and in the same position, on the iPhone 5s and 5, the iPhone 5s flash uses two LEDs, whereas the iPhone 5 uses one. 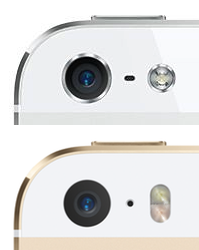 Some iPhone 5 cases have a teardrop-shaped camera opening—wider on the left to accommodate the camera lens, but narrower on the right for the LED; and a few actually use separate, custom-fit openings for the lens and the flash. These kinds of cases may partially obscure the iPhone 5s flash, or may be close enough to obscuring it that the case affects photo quality. If you want to use a case not specifically made for the iPhone 5s, be sure the opening(s) for the camera and flash are large enough to avoid this problem. If you’ve got an iPhone 5c, on the other hand, it has a completely new design with a new body style and different dimensions than the 5 or 5s. The iPhone 5c requires new cases specifically made for it. Like the iPhone 5 and recent iPad and iPod touch models, the iPhone 5s and 5c use Apple’s Lightning connector for all wired connections. (The phones ship with a USB-to-Lightning-connector cable for charging and syncing.) So any iPhone 5-compatible charging or syncing accessory—cables, docks, external batteries, car chargers, and the like—should work fine with the iPhone 5s and 5c. The exceptions, of course, are products that don’t physically fit. As with cases, the iPhone 5s will work with iPhone 5 battery cases, while the iPhone 5c will not. If you’ve got an iPhone 5c, you’ll need to wait for iPhone 5c-specific models. A cradle or dock specifically made for the iPhone 5 (left) will work with the 5s but not the 5c. 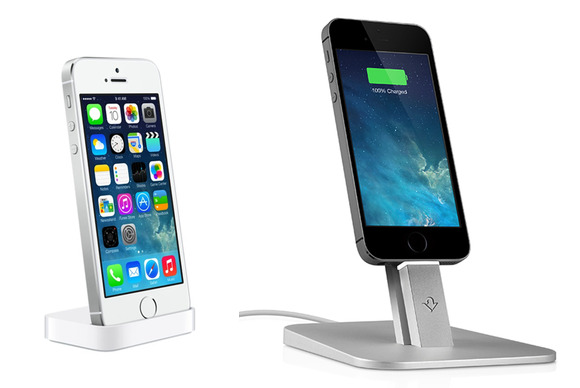 A “universal” dock, such as Twelve South’s HiRise for iPhone (right) will work with both. Similarly, any charging dock or cradle that fits the iPhone 5 precisely will fit the 5s, but not the 5c. Docks that aren’t custom fit for a particular phone model, such as Twelve South’s HiRise for iPhone, are compatibile with both new iPhones. There’s one important caveat here, though: Some charging accessories that worked with the iPhone 5 before iOS 7 was released may not be compatible—with the 5, 5s, or 5c—now. See “iOS 7-related accessory issues,” below. As with charging docks and cradles, Lightning-connector speaker docks (and dock cradles for connecting your iPhone to your stereo system) that precisely fit the iPhone 5 will work with the iPhone 5s, but not the 5c. Cradles that use a more-universal design, like the one on B&W’s Z2, should fit both new models. 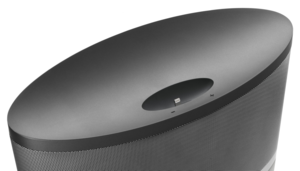 Non-iPhone-5-specific dock cradles, like the one on B&W’s Z2 speaker, will work with both new iPhone models. However, the caveat about charging accessories, noted above, also affects some speaker docks. See “iOS 7-related accessory issues,” below. As with any audio device, you can connect your iPhone 5s or 5c’s headphone jack to a set of powered speakers, or to your home stereo system, using standard audio cables. The drawback to this approach, as with any iOS device, is that you lose any on-speaker controls that require a dock connection, as well as the capability to charge your iPhone while listening. 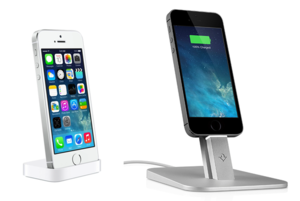 A nice compromise is to use Apple’s $29 iPhone 5s Dock or iPhone 5c Dock. This cradle holds your iPhone snugly and provides a line-level audio-output jack for better sound quality than the phone’s headphone jack. If you’ve got a spare USB-to-Lightning-connector cable, the Dock can even charge your iPhone while you’re listening. The iPhone 5s and 5c sport Apple’s now-standard multi-function headphone jack. This connection works as a standard headphone jack, allowing you to use any headphones with a 1/8-inch (3.5mm) stereo miniplug. But it also supports Apple-style stereo headsets (such as the included EarPods) that include an inline remote control and microphone. If that remote includes three buttons, two control volume level, and the third lets you control media playback, activate Siri, answer/end phone calls, and (when using the Camera app) take photos. You can also use headphone-jack microphones, such as IK Multimedia’s iRig Mic Cast. This functionality hasn’t changed. Like previous iPhone models, the 5s and 5c let you use any standard, mono Bluetooth earpiece or headset for making and taking phone calls. With most recent headsets, you can use the usual single-button controls: press to answer or end a call, double-press to redial the last number, and press-hold to activate Siri. If you have an A2DP-compatible headset or earpiece, you may also be able to listen to non-phone audio, including music—in mono, of course. The iPhone 5s and iPhone 5c offer the same support for stereo-Bluetooth audio as the past few iPhone models. You can pair the phone with multiple Bluetooth speakers and headphones, using the AirPlay button in Control Center to choose which device to send audio to. If your speakers or headphones include AVRCP playback controls (play/pause, previous, next), you can use those buttons to control playback, and, depending on how the accessory was designed, you may also be able to adjust your phone’s own volume level using volume buttons on the speakers or headphones. Lightning-connector audio accessories, such as Griffin Technology’s StudioConnect with Lightning and IK Multimedia’s iRig HD, that work with the iPhone 5 will continue to work with the iPhone 5s and 5c. However, as with docks, if an accessory has a cradle or other physical design made specifically to fit the iPhone 5, it may not physically fit the 5c. USB-based audio accessories, such as microphones, that currently work with the iPhone 5 using Apple’s Lightning to USB Camera Adapter should also work with the iPhone 5s and 5c. Apple’s Lightning Digital AV Adapter and Lightning to VGA Adapter are compatible with both new iPhone models, letting you output video to a TV, projector, or other video device over HDMI or VGA, respectively. Apple continues to restrict Lightning-connector video output to the company’s own accessories. (At least as far as we know—we haven’t yet seen a third-party Lightning-connector dock or other accessory that supports video out.) As with all Lightning-connector-equipped devices, Apple’s Lightning to 30-pin Adapters don’t support video, so you can’t use the video features of older 30-pin-dock-connector accessories with either new phone. Apple’s Lightning to USB Camera Adapter and Lightning to SD Card Camera Reader are compatible with both new iPhone models. Similar products from third-party vendors should also work, provided they’re licensed (see “iOS 7-related accessory issues,” below). Both new phones can take advantage of Apple’s Lightning to 30-pin Adapters to work with accessories that use the older 30-pin dock connector. However, the same restrictions apply here as applied to the iPhone 5: Most audio and charging accessories will work fine, though very old docks that charge using FireWire circuitry won’t charge your iPhone 5s or 5c. Neither adapter supports video, so if you’ve got a 30-pin accessory that provides video output—say, for showing your iPod or iPhone’s video on your TV—that output won’t work with either new iPhone. Finally, as with the iPhone 5, Apple’s adapters don’t support iPod-out mode, a special mode that lets particular accessories, such as car stereos and some whole-home-audio systems, display a version of your iPhone or iPod’s menus on the accessory’s own screen. External keyboards Keyboards? Yes, keyboards. While most people think of the iPad when it comes to external keyboards, the iPhone supports third-party keyboard accessories. (I use Logitech’s Easy-Switch Keyboard at my desk to quickly type messages and other text in several iPhone apps.) And the iPhone 5s and 5c work perfectly well with these these accessories. However, iOS 7 brings some bad and some good when it comes to using an external keyboard. On the bad side, if your external keyboard has a dedicated Spotlight-search key, that key no longer brings up a Spotlight search under iOS 7. From a gesture standpoint, Apple changed the way you access Spotlight in iOS 7: Instead of pressing the Home button (or swiping to the right) when on the first Home screen, in iOS 7 you swipe down on any Home screen. However, it doesn’t appear as though keyboards emulated gestures to access Search—there was some kind of dedicated Search command—so I suspect that this is a bug that will be fixed in an update to iOS 7. On the good side, iOS 7 has added support for a few new shortcuts when using an external keyboard (thanks to Tao of Mac for the tip). Specifically, when using Safari, several OS X keyboard shortcuts now work on iOS: Command+T opens a new tab, Command+L focuses on (and selects everything in) the location/search bar, and Command+W closes the current tab. iOS 7 is still missing many potentially useful keyboard shortcuts (Command+Tab for switching between apps, anyone? ), but these are welcome improvements. Some unlicensed accessories won’t work with an iPhone running iOS 7. Third-party Lightning-connector accessories The other iOS 7-related issue relates to third-party Lightning-connector accessories. Apple has long recommended that people use only officially licensed accessories—those displaying the Made for iPhone, Made for iPad, or Made for iPod badge—with their iOS devices. However, licensed gear tends to be more expensive than unlicensed, both because Apple charges a fee for licensing and because most licensed gear comes from name brands. So unlicensed gear, which tends to be cheaper, has become quite popular. You’ll find it everywhere online, as well as at budget mall kiosks, the shelves of the local discount store…I’ve even seen it at the gas station down the street. Most of the unlicensed gear I’ve seen has been less-expensive items such as charge/sync cables, AC chargers, and battery packs—items where, because of their lower cost, Apple’s licensing fee is more difficult to absorb into the cost of the product. Most speakers, higher-end docks, and other “premium” gear I’ve seen is licensed, likely because their higher prices make it easier to cover the costs. How does your phone or tablet know it’s connected to an unlicensed accessory? Licensing the Lightning connector gets a vendor more than just a badge for its packaging. It also provides access to special authentication circuitry inside the connector itself. If that circuitry isn’t present—as it isn’t on unlicensed gear—iOS 7 throws up the error (and, in some cases, it appears, prevents the accessory from functioning). Some companies have attempted to reverse-engineer the circuitry, some more successfully than others, but the risk to buying unlicensed gear is now greater than before. 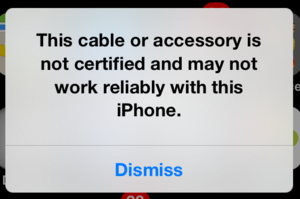 If you’ve got an unlicensed charging accessory that no longer works under iOS 7, a Reddit user offers a workaround that, in our testing, sometimes works. However, use it with caution: There’s no way to tell if you’ve got a high-quality, safe accessory that just isn’t licensed, or if the manufacturer also cut corners in other places, resulting in a dangerous product.